Endothelin 1 is associated with important vasoconstriction and has been implicated in the pathogenesis of CKD. 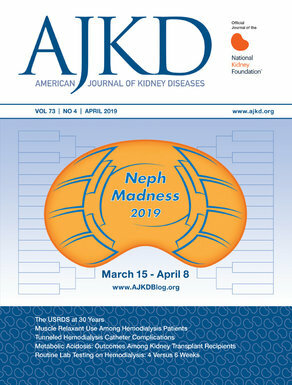 In this study, amongst 5200 African American patients from the Jackson Heart Study, higher endothelin 1 levels were associated with reduced kidney function at baseline and the highest quartile of endothelin 1 was associated with an 83% greater risk for incident kidney disease (defined as a eGFR < 60 ml/min /1.73 m2 and a >25% decrease from baseline). Although I was not able to discuss the findings with the authors, these results indicate that endothelin 1 is a strong risk factor for CKD and adding endothelin 1 to prediction models may have an utility. In addition newer therapies targeting endothelin 1 receptor antagonists may be implemented in this high-risk population. Post written by Dr. Magdalena Madero Rovalo, eAJKD Advisory Board member; Jefe del Depto. de Nefrología, Instituto Nacional de Cardiología Ignacio Chávez; Profesor Titular Curso de Nefrología UNAM; Investigador Nacional SNI II; Presidente del Instituto Mexicano de Investigaciones Nefrológicas.